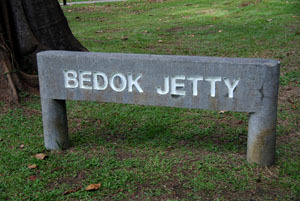 Bedok Jetty. 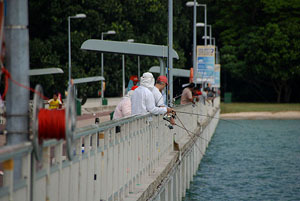 The Bedok jetty would probably be the place where most Singaporean anglers would have visited at least once within their angling life. 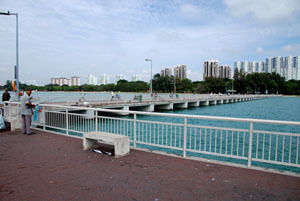 The jetty is located along the East Coast Park near the East Coast Lagoon and East Coast Lagoon Food Village/Centre. 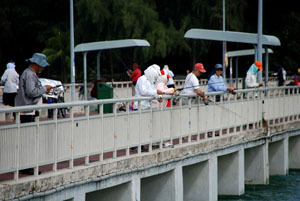 This location is a good place for all anglers, from those who have just started fishing to the most seasoned fisherman. 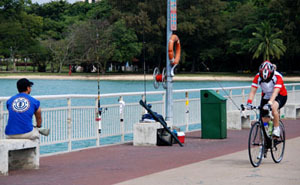 There are also toilets and showers facilities nearby so it’s a great place for family fishing. 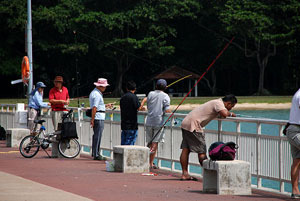 And with the food centre within walking distance there is no reason to go hungry when you’re fishing there. 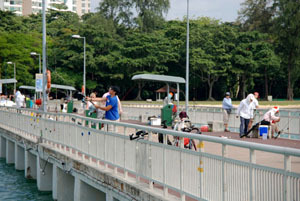 The jetty is shared by joggers, bladders, cyclists and people just there for a stroll, so you have to watch out for them when you’re fishing, especially when you’re casting your rig. 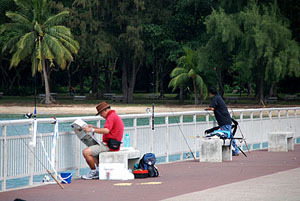 The photo to the left shows anglers fishing for Tambans, with feathered jigs. 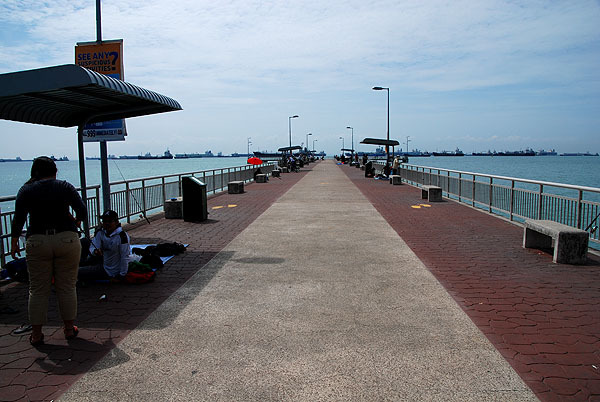 You can actually catch a huge range of fishes from the jetty if you're lucky, its possible to catch bait fishes like Herrings like Tambans, Assam Fish, Selar and some small Mackerels. Bottom fishes like groupers, grunters, sweetlips, snappers, triggers, catfish and much more have been landed. For mid water species you might get to see queenfish, diamond trevally, golden trevally, wolf herring, todaks and of course the barracudas. 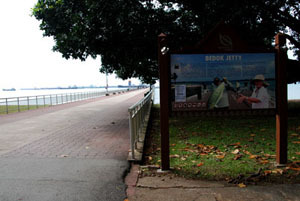 The jetty has also been famous for the biggies that have been landed occassionally, you could have huge rays, sharks, skates and cobia to name a few. 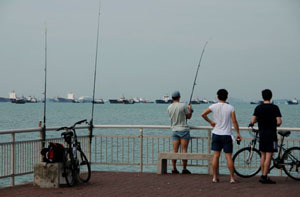 In the night you can also see fisherman catching squids and cuttlefish. 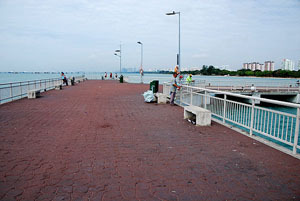 There is a shuttle bus 401 that runs along the East Coast park Service Road. It operates on Saturdays (from 1400hrs), Sunday and Public Holiday (from 1000hrs). 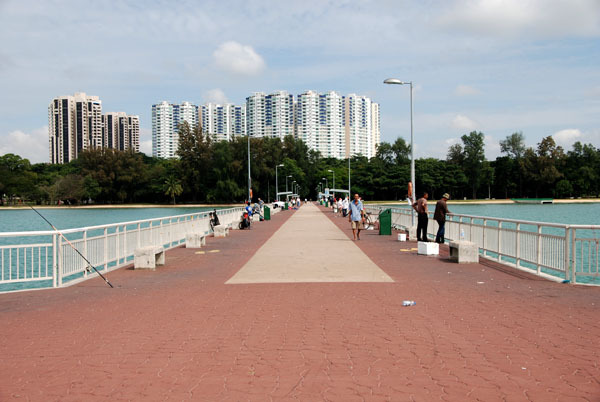 The nearest MRT station would be Bedok Station where you can take a bus 31 to Marine Parade Road outside the Lagoon View Condo which is walking distant to the jetty.